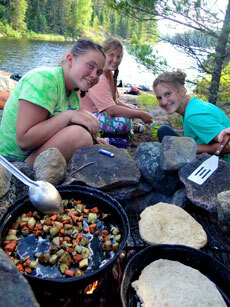 Tip: Feel your best this summer by fueling up on nourishing foods cooked on the grill or over the campfire. The season of weekends at the cabin, barbecues at the park, and picnics by the lake is finally upon us! Once the weather warms, Minnesotans go outside and try not to come back indoors until the fall breezes blow – that means outdoor cooking all summer long. A little bit of planning goes a long way toward healthy eating outdoors. Pack your backpack full of these tips for nourishing outdoor cooking. When preparing for a picnic or camping adventure, plan every meal and snack you will eat. There’s no going back to the kitchen once you are at the park or campsite – and anyone who has tried to slice through crusty bread with a Swiss Army knife has learned the hard way about the importance of planning ahead! Make a list of all ingredients and utensils you will need for preparing, serving and eating your meals. When it comes to outdoor cooking, it is easy to get stuck in a rut of hot dogs and hamburgers - but there are many other yummy, nourishing and easy options. Breakfast Burritos provide sustained energy for an active day exploring outdoors. Cook eggs, beans and veggies ahead of time, wrap in a whole wheat tortilla and cover with foil. They are easily reheated over the coals of the campfire. Hobo Stew is a versatile and simple campfire meal. Fill a large piece of foil with meat, fish, tofu, or any kind of protein you would like, along with lots of veggies and some seasonings. Seal up the pouch and allow it to cook over the coals until the meat is cooked. This is a great meal for families, because everyone can choose what they put in their own pouch. Kebobs are the ultimate choice for outdoor cooking. Cook them on the grill or on a grate over the campfire and load them with veggies and meat or poultry for a nourishing, satisfying outdoor meal. Our Cajun Chicken Kebobs are easy, delicious and can be made more or less spicy depending on your family’s tastes. Campfire Apples are an irresistible alternative to summer’s quintessential treat, S’mores. Wrap cored apples in foil with cinnamon, raisins, nuts and a dab of butter, and bake the pouches over the coals – it’s camping apple pie! Eating outdoors requires extra diligence to keep food safe. Perishables that have been left out on the picnic table for longer than two hours – or one hour if the temperature is above 90 degrees – put you at risk for foodborne illness. Store food in a cooler with plenty of ice before you prepare or serve it, cover food to keep bugs and other debris out while eating, and promptly store any leftovers. Those black, crunchy bits on your barbecued chicken may be yummy, but they contain carcinogenic chemicals. When grilling beef, pork, fish or poultry, make sure food is well cooked, but avoid burning to reduce the formation of cancer-causing compounds. Eating outdoors is an opportunity to savor your food without modern-day distractions. A summer of healthy meals on the grill or campfire nourishes your body and mind – and helps you enjoy this season of outdoor cooking to the fullest.